District SA Telugu/ English LP Promotion Seniority list, Vacancies list Released. 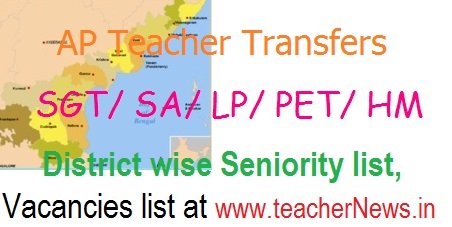 AP Teachers Transfers / Promotions SGT/ SA/ LP/ PET final Seniority list, Vacancies list 2019, Teacher Transfers Vacancies list SGT/ School Assistant/ LP/ PET District wise Seniority list 2019. AP Teachers Transfers 2019 SGT Seniority List, Transfers SGT Vacancies Position, School Assistant Telugu, English, Maths, Physics (PS), Biology, Social, Hindi, PET, Grade 2 HM, LFL Head Masters announced at the official DEO District websites. Teachers. All Districts of Andra Pradesh Teachers Transfers Tentative Seniority list 2019, AP Transfers, Vacancy, Rationalization , web option counseling , online application confirmation. All Districts of Andra Pradesh/ AP Teachers Transfers / Promotions list in DEO Anantapur , Chittoor, Kadapa, Kurnool, Prakasham, Guntur, Krishna, West Godavari, East Godavari , Vizag, Nellure ,Vijayanagaram and Srikakulam Districts. AP Objections Report District wise and Final Seniority list. Rationalization of Posts in High School and Upper Primary Schools Details, Rationalization of Posts in Primary School and Upper Primary Schools SGT & PSHM details were updated. Seniority lists of SAs, LPs, SGTs and PETs working in all Andra Pradesh/AP Districts are made available. AP Teacher Promotions Seniority list 2019 SGT/ SA/ LP/ PET Tentative Final Seniority List and Vacancy List 13 Districts SGT (Telugu/Urdu/Kanada/S.A/L.Ps/ PETs/PDs and Anantapur , Chittoor, Kadapa, Kurnool, Prakasham, Guntur, Krishna, West Godavari, East Godavari , Vizag, Nellure ,Vijayanagaram and Srikakulam Districts Tentative Seniority List and Vacancy List.